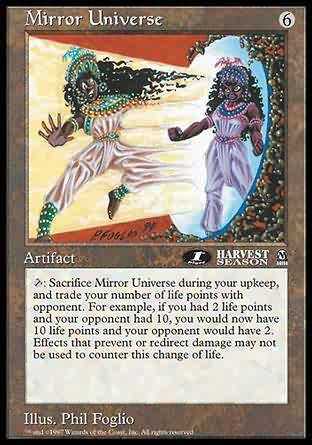 tap: Sacrifice Mirror Universe during your upkeep, and trade your number of life points with opponent. For example, if you had 2 life points and your opponent had 10, you would now have 10 life points and your opponent would have 2. Effects that prevent or redirect damage may not be used to counter this loss of life. T, Sacrifice Mirror Universe: Exchange life totals with target opponent. Play this ability only during your upkeep. You can try a different Card Set for more purchasing choices.